Sr. Cecilia Cotter - who can be thanked for instilling in me an appreciation for music - was our guide for County Cork. Here she can be seen flanked by the parents. 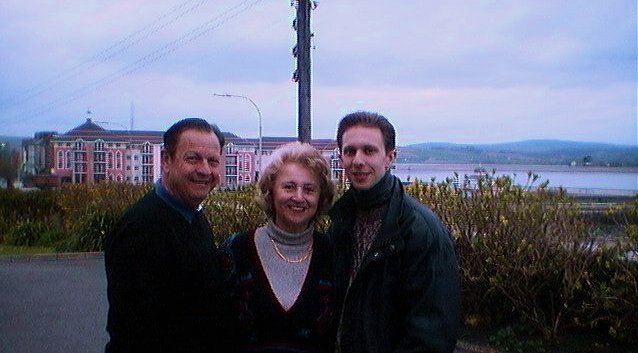 The picture was taken in Cobh, just in front of St. Colman's Cathedral (hArdeaglais Naomh Colmán, in Gaeilge) overlooking Cork Harbor, one of the biggest natural ports in the world. While in Cobh--pronounced 'cove' and also known as Queenstown-- we went to the Queenstown Heritage Museum so George (and Joy ???) could see the port from which the Irish ancestor(s) sailed. Queenstown was also the final port of call for the Titanic before it set course for New York. 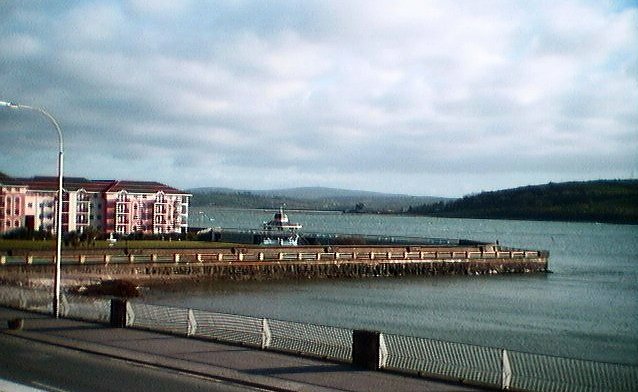 This is an unobstructed view of Youghal Bay as seen from in front of the Loreto Convent. Not a bad view! And there's our future bay side condo again. Return to the JOURNAL page. Return to the IRELAND page. This page was created by David M. Rojas and last updated on Monday April 05, 1999.